Easily load or unload ladders by yourself with this all-aluminum Lock-Down Ladder Rack for the 2014 & Newer Ford Transit Connect. Once ladder is loaded, a simple turn of the handle clamps it into place. Add your own padlock to the handle mechanism to prevent ladder from being removed from the rack. 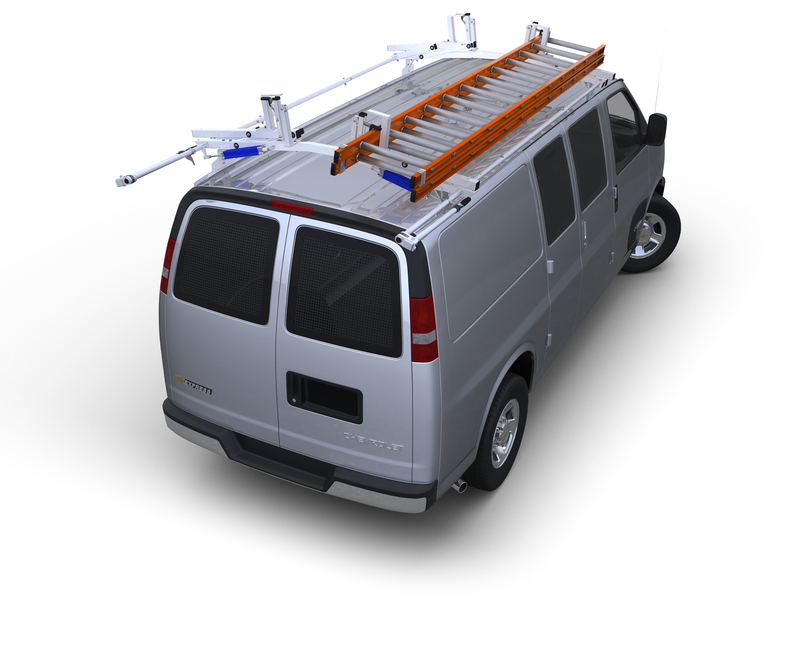 Easily load or unload ladders by yourself with this all-aluminum Lock-Down Ladder Rack for the 2014 & Newer Ford Transit Connect. Once ladder is loaded, a simple turn of the handle clamps it into place. Add your own padlock to the handle mechanism to prevent ladder from being removed from the rack. Rack is available in single (curbside) or double Lock-Down configurations as well as for both Standard Wheelbase and Long Wheelbase vehicles. You can also purchase a Standard Base Rack without Lock-Down and add the lock down upgrade to either the street or curb side at a later date. Rack mounts in a full length aluminum channel that attached to the vehicle utilizing existing factory mounting points eliminating the need to drill holes in the roof. This all-aluminum Ladder Rack has a load capacity of 150 lbs. and comes complete with stainless steel hardware and is protected by a durable white powder coat finish.